March 9, 1933 Lloyd Price, Rock and Roll and R & B singer, was born in Kenner, Louisiana. As a young man, Price had formal musical training on trumpet and piano and sang in the gospel choir. His first recording, “Lawdy Miss Clawdy,” was a huge hit in 1952 and from 1957 to 1959 Price recorded a series of national hits, including “Just Because” (1957), “Personality” (1959), “I’m Gonna Get Married” (1959), and “Stagger Lee” (1959), which topped the pop and R & B charts and sold over a million copies. Price received the Pioneer Award from the Rhythm and Blues Foundation in 1995 and was inducted into the Rock and Roll Hall of Fame in 1998. Lloyd Price Avenue in Kenner is named in his honor and the city annually celebrates Lloyd Price Day. Price currently manages Icon Food Brands, which makes a line of primarily Southern style foods. 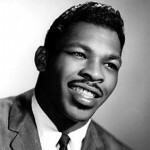 He published his autobiography, “Lawdy Miss Clawdy: The True King of the Fifties: The Lloyd Price Story,” in 2009. ← March 8th in African American History – Clarence M. Mitchell, Jr.